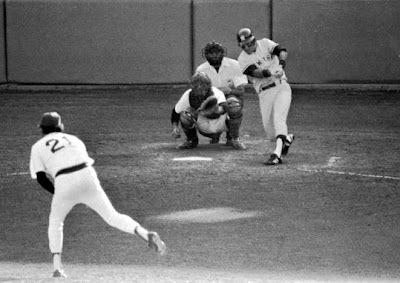 In the Spring and Fall of 1978, Red Sox fans saw their beloved team lose a 14-game lead over the hated New York Yankees, which included a four-game sweep at Fenway by the Yanks and forced a one-game playoff for the AL East title. Fans were fixated on the October 2 game, which would go on to earn light-hitting shortstop Bucky Dent his endearing (and enduring) profane nickname. The city was also burning under the national spotlight over the politically and socially volatile issue of forced busing over which the otherwise liberal-minded city and its residents became viewed as racially hostile as the Deep South. As violent protests raged, though eventually subsided even as the issue persisted, baseball served as a unifier, an escape. 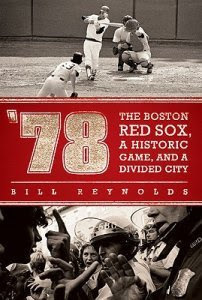 In Boston, where politics and baseball are inherited religions, author Bill Reynolds takes us back in '78: The Boston Red Sox, a Historic Game, and a Divided City, and examines the dual relationship of the city with its communities and its team during the tumultuous era. HuggingHaroldReynolds: Was your intention to write a historical/social issue piece or a baseball book? Where did the idea come from to marry the two? Bill Reynolds: My idea was to write what I hoped would be an interesting book, one that used a great baseball game as the thread to get at larger issues. I’ve long believed that sports are not an island unto themselves, but an integral part of the culture. The idea came from going to a Red Sox game a couple of years ago and speaking to some fans – one at about 40, the other in his early 30’s, and both from New England – who had no idea that the busing crisis had ever existed. HHR: The busing order came about in '74, and you go on to characterize the '77-78 school year as "relatively tranquil" - why then draw the parallels between these two particular events - busing & the '78 playoff game? Why not, say, the '75 Series? BR: I liked the fact that even though things are starting to quiet down, the furor over busing and the ramifications of it remain. I also liked the fact that it had already gone on for four years, and felt like in ’75 it had just been a year. HHR: Save a few Bill Lee quotes and a random PSA or two, the players were both physically disconnected and vocally silent on the busing and race issues and accompanying violence. Given the view of Red Sox baseball as an escape from these harsh realities, were the players better served remaining politically neutral despite local volatility? BR: Even though with the exception of Bill Lee the players avoided speaking about the issue, busing was like the elephant in the clubhouse, to the point that for several of them it took over a decade to speak about it, specifically for Jim Rice, Luis Tiant, and Fred Lynn. I’m not surprised, though—busing and race was such a volatile issue then that there was no way they could win back then by commenting on it. HHR: How at fault were politicians and community leaders, many of whom have gone on to successful political careers - others who saw their aspirations extinguished, in stoking the fires? BR: I feel that that many of the political and community leaders also were caught in a no-win situation, especially Mayor Kevin White, who had national aspirations and saw them blown up by busing. The issue was simply too ugly and too divisive to have any political figure emerge from it unscathed, regardless of where they were on the issue. HHR: In 2004 Barry Bonds noted his unwillingness to play in Boston because it was "too racist," and an article as recent as last year MLB analyst and scribe Ken Rosenthal highlighted the team's current lack of African-Americans (while reminding us of the Sox's notorious racial history). How much of the recent perceptions are based on the city's past as opposed to present realities? Has the city actually come that far? BR: I think those perceptions are all based on the past. In the past decade you can make a case that the three most popular players in Fenway were Pedro Martinez, Manny Ramirez, and David Ortiz, and that the perception of Boston as being a racist city is also in the past. That doesn’t mean race is not an issue in Boston, but then again race is an issue in America, and I don’t think Boston is unique in this regard. HHR: After years of his coming up short, what are both your professional and personal thoughts on Jim Rice finally gaining enshrinement to Cooperstown. Which was a bigger factor that held him back - his perceived attitude amongst sports writers or his lack of coming through in any notable big, clutch moment? BR: There’s no doubt that Rice’s miserable relationship with the media through the years didn’t help him, but he also never had those huge signature moments in his career that arguably would have gotten him inducted earlier. HHR: Can you elaborate on the notion that fans can cheer on players of different races and nationalities, when they perform for their respective teams, but still hold a NIMBY view of others when it comes to their communities? BR: I think that’s the nature of fandom and, on a deeper level, the more we get to know people the less we are bothered by race, and we feel we know athletes. HHR: Can baseball really serve as a healing salve for social issues? BR: Sports can help be a healing salve for social issues, in that they can bring people of different races and backgrounds together for a while in a common cause, but that doesn’t mean they’re going to eradicate all the problems. HHR: What have the lessons of '78 taught the city of Boston and the country as a whole that watched the actions transpire? BR: That’s a great question, and one I really don’t have an answer for. 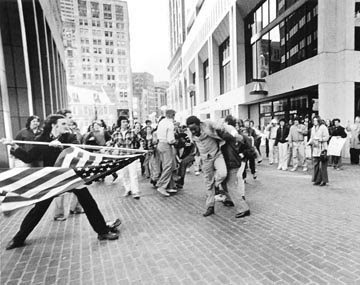 I do think, though, that one of the lessons learned from Boston’s busing tragedy was that nobody won, that all the years and all the hate and all the violence and in then end everyone lost. Maybe that’s the enduring lesson. I think that Red Sox is the best baseball team I a fan of them but I think that the team need a big sponsor such as Generic Viagra because the team needs some good new players !